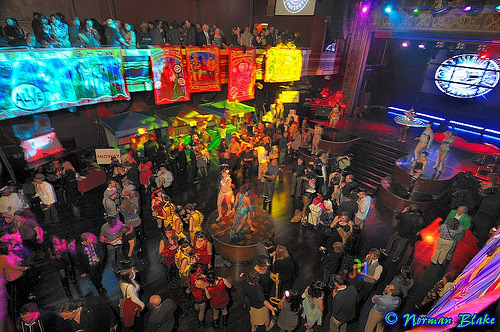 On Saturday, the Coney Island Sideshow, Burlesque at the Beach and an entourage of quirky entertainers take over Webster Hall in Manhattan for Coney Island USA’s Spring Gala. Highlights of the Ides of March party include the mock assassination of Caesar, a Mini-Mermaid Parade, and over 50 performers from go go and burlesque dancers to sideshow sword swallowers and fire eaters. Tickets for the annual fundraiser start at $100. Online ticket sales end Friday, March 14th at 5pm. Tickets at the door at Webster Hall on day of show beginning at 6:30pm. In an article about Coney Island for Islands Magazine’s “Best Beaches” issue in 2000, I asked “How are mermaids different from mortal women?” A siren wearing little more than a sequined fishtail and a sprinkling of glitter looked me in the eye and said, “Mortal women don’t have the boom-boom shimmy-sham that mermaids possess. For another thing, we have all that fantasy on our side.” Everyone who comes to Coney Island partakes in that fantasy. 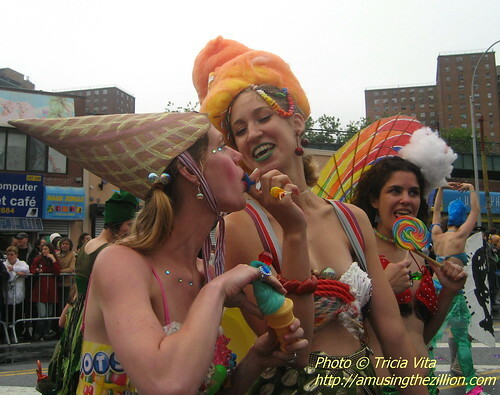 It’s hard to imagine kicking off the summer in Coney Island without the Mermaid Parade, but it could happen for the first time in 31 years unless $100,000 is raised via Kickstarter by June 3rd. Coney Island USA, the non-profit arts organization that puts on the free parade, was devastated by Superstorm Sandy. Its sideshow, burlesque shows and Freak Bar have yet to open for the season as renovation of the flood-damaged first floor is underway. While Coney Island’s rides, games and Boardwalk shops and eateries opened as usual on Palm Sunday, Coney Island USA’s theater has remained dark. With no revenue coming in, there’s a budget shortfall in the mermaid department. “A free parade is expensive,” says the intro on Kickstarter. “As the crowds have grown to 750,000 people over the past years, we’ve had to contend with more regulations and restrictions that have sharply increased the cost of the event.” The good news is the crowdfunding campaign to save the June 22nd event has already raised one-third of the $100,000 goal with contributions ranging from $1 to $250. But Kickstarter is an all-or-nothing funding model. The project must be fully funded for the parade to be saved. Thank you gifts include freak flags ($5 or more), pasties and tote bags ($40 or more), and a VIP spot on an elevated roof deck to watch the parade ($150 or more). When “Last Summer at Coney Island” premiered in August 2010 at BAM, the audience got teary eyed during the scene in which Astroland’s lights were extinguished, ride by ride, for the final time, and the illuminated Astrotower made its last descent. The award-winning documentary by JL Aronson chronicles changing times in Coney Island with riveting scenes featuring Thor Equities CEO Joe Sitt and Astroland owner Carol Hill Albert, among others. The film ends with the City Council passing the rezoning in July 2009. Presented as part of the Film Wax series “Brooklyn Reconstructed,” the screening will be followed by a discussion with the film-maker and Nate Bliss of the Alliance for Coney Island and NYC Economic Development Corporation about how Coney Island is faring today. Wednesday, January 23rd at 7:00pm at the Brooklyn Society for Ethical Culture, 53 Prospect Park West in Park Slope, Brooklyn, NY, 11215. Suggested $5 donation. While Coney Island USA’s theater is closed for renovations after flood damage from Superstorm Sandy, the Coney Island Sideshow is performing on Wednesday nights all winter long at the Slipper Room. This week’s stars are knife-thrower extraordinaire The Great Throwdini and his target girl Lynn, and sword swallowers and fire eaters Kryssy Kocktail and Adam Realman. Last week Adam debuted the sensational act shown in the video — blowing up a hot water bottle till it bursts! Wednesday, January 23rd. Doors at 7:00 pm, Show at 8:00 pm. Slipper Room, 167 Orchard St, New York, NY, 10002. Over 21. Tickets $10. Sponsored by the Young Patrons Program of the Wildlife Conservation Society, Wednesday’s “Brews for NYAQ” is a fundraiser for the New York Aquarium, which is also closed due to damage from Sandy. The event includes drinks, hors d’oeuvres, and a presentation at 8:30pm by Jon Forrest Dohlin, WCS Vice President and Director, New York Aquarium. In Charles Denson’s film shown above, Dohlin dives Coney Island Creek in a Mark V diving helmet. The film was shot several days before the hurricane and the flooding of the Creek. Wednesday, January 23rd from 7:30pm-10:30pm. Brooklyn Brewery, #1 Brewers Row, 79 North 11th Street, Brooklyn, NY 11249. Tickets $50 online, $65 at door. ATZ is pleased to present this Coney Island Polar Bear’s eye view of the 2013 New Year’s Day Plunge with videos by Polar Bear Club members Jim McDonnell and Princess Mermaid Capri. The Polar Bear Club, which has 150 members who swim every Sunday in the winter, celebrated their 110th year with the 2013 New Year’s Day Plunge. About 2,000 people participated in today’s event, which is free and open to the public. They earned an “I Did It” certificate from the Club and “bragging rights forever,” as one participant says in Jim’s video. The water temperature was 41F/5C, air temp 37F and wind chill 27F, according to Capri. “It went very well,” Polar Bear President Dennis Thomas told ATZ. “The Parks Department wanted a little more control and less chaos. And we did a better job of getting everyone registered.” Last year on New Year’s Day, temps in the 50s drew a record number of participants– more than 3,000— making the changes advisable from a safety standpoint. Besides being a great way to start off the new year, the annual event is a fundraiser for Camp Sunshine, a retreat for children with life threatening diseases. According to Thomas, almost $22,000 was raised for Camp Sunshine and they expect to meet their goal of $25,000. This year, funds are also being raised for Coney Recovers, a coalition of local nonprofits helping with relief efforts after SuperStorm Sandy. If you missed the event, it’s not too late to donate online or mail in a check. 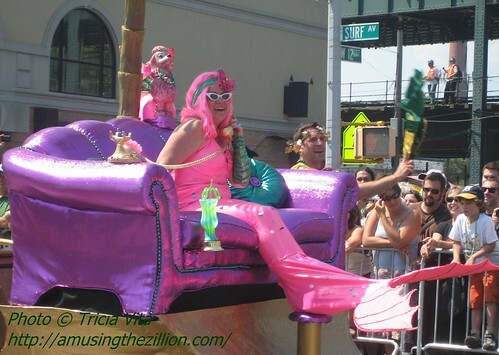 Some of the wacky costumed characters are familiar from previous years’ swims or reminiscent of the Mermaid Parade. In photos and videos, we spotted the bagpiper, the Metrocard Man, Santa Claus, Hawaiians, various superheroes and the guys with the inflatable octopus toy as well as penguins and polar bears! Some carried hand-made signs that read “Free Polar Hugs” and “Polar Bears from the Bronx.” Two Japanese guys in bikinis from Tokyo Circus shared a timeless message: “Your Smile Is Beautiful.” Happy New Year from Coney Island! ATZ contacted the club’s founder, 15-year-old Taylor Stein, for more information. Taylor got the Save Coney Island T-shirt that he’s wearing in the photo when he visited Coney Island last summer with his Dad. The Stein family is originally from Brooklyn. Taylor returned to California more determined than ever to help save Coney Island’s shrinking outdoor amusement area from high rise development and to preserve its historic structures. Didja ever notice the first three letters of fundraiser are F-U-N? Saturday’s benefit for Save Coney Island is “Guaranteed to be a raucous good time!” The Save Coney folks have “Gone Country for Coney” with a Country/Bluegrass Musical Jamboree, Wild West Variety Show and chow from Jake’s BBQ. 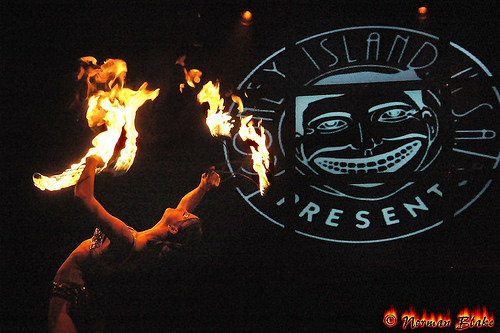 Extra Added Attractions include a Burlesque Show After Party. It’s all happening this Saturday from 3 till 9:30 pm at Galapagos Artspace in DUMBO.